This file has information on my approach to teaching and a brief listing of my classes for this year. Then follows this year's CATS dates, detailed discussion of each of my classes, and a short piece on what it's like to attend a stitch festival. I try very hard to make my classes a part of your wonderful memories of these festivals and hope you'll join me this year! My goal is for you to leave my class confident in the techniques so you can finish the project at home. I'm willing to give you extra help outside of class and will provide you with information on how to contact me after the festival is over, should you have questions (or want to brag - - this I encourage! In fact, if you'll send me a photo - - or better yet show me in person - - one of my designs completely finished, I have a special gift for you). I want you to have a great time in my class! Stitching is fun!! Lefties: I have separate instructions/illustrations for you for tricky stitches and will demonstrate the stitches left-handedly for you. This is my seventh year teaching at festivals! In 1997 and 1998, I taught at the Spirit of Cross Stitch. 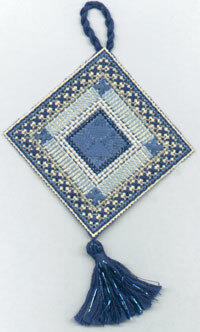 In 1999 and 2000, I taught for Heart of Cross Stitch. From 2001 through 2004, I have taught at CATS (Creative Arts and Teaching Show) and will be doing the same in 2005. I have a ball in my classes and hope my students do, too. Davenport, IA: I will not be teaching at this festival. I will be teaching 8 classes in 2005 and am scheduled on all days of the festival. Surely we can get together! I also will be participating in the Show, Shine, and Share event. The students are the "main event," however! Everyone is encouraged to bring a finished piece for display. All participants choose their favorite from among them, and the teachers do the same. Both of the two winners receive an extravagant prize! The quality of the stitching and the diversity of the projects is astounding! Truly, a not-be-to-missed event! There's a scrapbook, too, in which teachers share a project, a favorite recipe (now, what would be the type of recipe I would share....? ), and a little about themselves. There are also chocolate desserts involved after the program. Class descriptions in the Show Book are limited in space, and, if you know me, you know that a few lines of type is hardly enough to cover any topic! I decided to put more information here on my home page for those who would like greater detail than is available in the Show Book. I have written a description of each class, information about class time and length, project size, kit contents, and so on. Use your browser's "back" button to take you to the top of the following class list. a follow-on to or a substitute for "stitches notebook" - other basic needlework techniques for working Hardanger, Bargello, blackwork, etc. This is the 9th year for this class. This popular class, the "grandmother of them all" since I've been teaching it for 9 years, is a hands-on survey different techniques and materials in counted-thread embroidery. 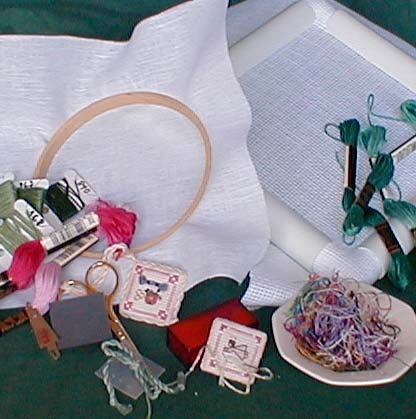 Some of the topics included are: gadgets and tools; survey of threads (cotton, rayon, metallic, silk, pearl cotton, space-dyed); survey of fabrics (evenweave, Aida, silk gauze, perforated paper, knitted stockinette, waste canvas); techniques with threads (stripping, finding the grain, starting and stopping, storing threads, avoiding and getting rid of knots, working with space-dyeds, etc. ); techniques with fabrics (edge preparation, getting rid of wrinkles, figuring cut size, etc. ), which needle for which use, tips and hints (away waste knot, railroading, laying tool, mounting fabric, blended needles, avoiding ridges, etc. ); basics of blackwork, duplicate stitch, Bargello, couching, string art stitches, Celtic knot work, bead application, silk ribbon embroidery, silk gauze, stitching over one, waste canvas; twisted cord and tassels; washing, ironing, blocking, stain removal; resolving kit materials problems; stitching for competitions; finishing techniques and quick/inexpensive framing suggestions; preventing stitchers' ailments; how to find out-of-print charts; alternative skin tones, etc. There is a large section of the notebook about copyright and needlework. The encyclopedia also has an extensive material on the business of needlework: writing for needlework magazines; designing for needlework magazines; designer support programs; stitching on commission, and on and on and on! 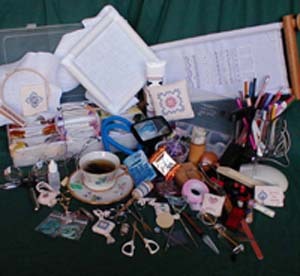 There is no major project because this is a techniques class, but there is a chart for making a Christmas tree ornament from some of the supplies in the kit, as well as charts for a Berlin work rose, a sampler basket of flowers, etc. And you'll also have stitched lots of samples to keep on hand for reference, as well as the rest of the kit contents for further experimentation. We can't cover all of these in 3 3/4 hours, so I've chosen for class time those topics most in demand: stitching with different threads and different grounds; basics of blackwork and Bargello, how to stitch a Celtic knot without going nuts, couching, bead application, silk ribbon embroidery, silk gauze and stitching over one; conquering the knot, including basic knot technique (you will leave being able to make a Colonial knot, which is a great substitute for a French knot); working with blending filament; blended needles; railroading; using a laying tool; making twisted cord and tassels, and more, I hope, depending on how time runs. Other stitches taught: Waffle, Leviathan, Satin, Rice (for ornament). Zweigart(r) Zweigart (r) Aida & evenweave, perforated paper, 40-count silk gauze and waste canvas doodlecloths, etc. cotton, rayon, and metallic floss; space-dyed cotton floss; silk thread; Floche; pearl cottons; blending filament; silk ribbon; etc. This is the 8th year for this class. 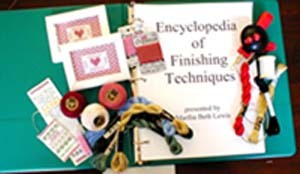 You will learn a number of finishing techniques. 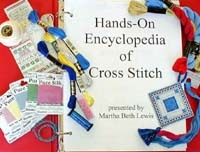 Some of the techniques in the encyclopedia are hemstitching, nun's stitch edge, rolled hem, fringe, and other edges; how to cover foamcore with fabric, including how to make mitered and simple-fold corners and lace needlework; chain stitch joining; twisted cords; regular tassels, Maltese tassels, and "fake" surface tassels; Hedebo buttonhole loops; needle-crocheted cord; bead fringe, bead joining; ruffles, ribbon ruching; working with fancy-selvaged Aida and linen banding; finishing pillows, afghans, bellpulls, Christmas stockings, banners, needlerolls, "origami" ornaments/pincushions; constructing and stuffing standing pieces; finishing doll-house miniatures; making bias-covered welting; covering a sphere with fabric; setting a pincushion in a shell or other "small;" threading ribbon through rings; lining a basket with fabric; covering a brick; constructing a box from perforated paper; washing, blocking, ironing; float mounting; techniques for finishing more UFOs; and more. There really isn't one since this is also a techniques notebook, but you'll stitch a tiny Rhodes heart sampler, finish the edge, and mount it on the foamcore you've covered in class. You'll also have lots of "samples" to use as references when you get home. Obviously, we can't cover all of these in just under 4 hours, either, so I've pulled out the techniques that most people want to learn, such as doing a nun's stitch edge, float mounting a sampler, lacing needlework and making corners, hemstitching, rolled ("scarf") hem, chain joining, twisted cord, tassels, and Hedebo and needle-crocheted cord. 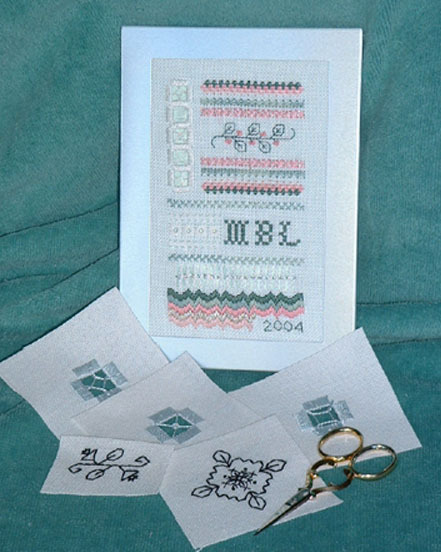 Other stitches taught: Rhodes heart stitch, Smyrna cross stitch (for the sampler). 3-ring notebook encyclopedia of illustrated instructions, tips and tricks, stitch diagrams, list of over 175 project ideas, sampler chart, chart of 7 alphabets, suggestions for color substitutions for skin/hair for non-Caucasian ethnicities, etc. This is the 4th year for this class. I don't know about you, but I am a self-taught cross-stitcher. As a result, I did a lot of things that I later found out I could have done differently and produced better results. Things like how to strip and recombine thread strands. How to make floss and pearl cotton less prone to knots. How to get knots out of the thread (rather than yank 'em tight to make the knot smaller so I could muscle them through the fabric holes - - or cutting them off). I didn't know how to open a ball of pearl cotton and wasted a lot of it by just cutting across the "belt" to free an end. Metallic threads? Space-dyed threads? Huh? I didn't know pea-squat about which needle was best to use for which purpose. I didn't even know there were different sizes of needles! 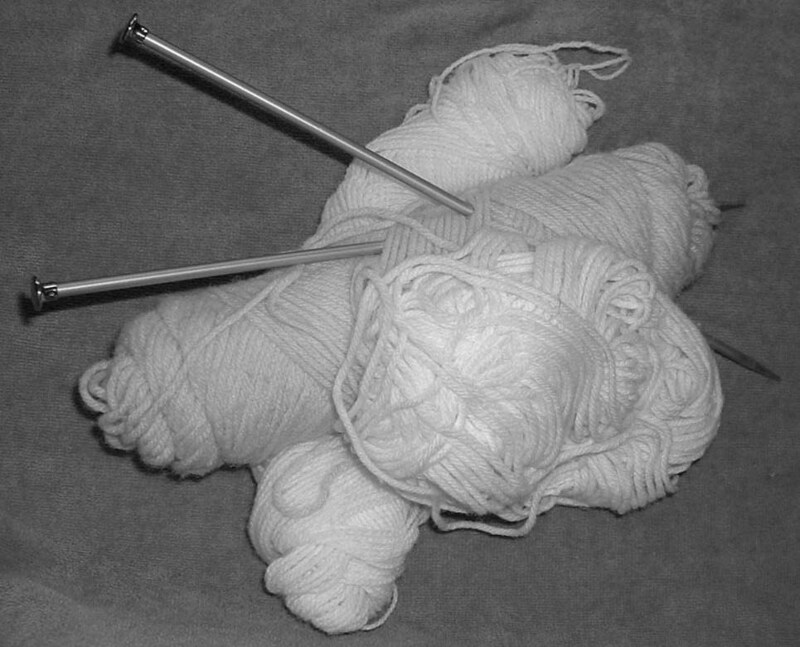 And I threaded my needle by "poke and pray." I guessed how large to cut my fabric for a project, though I was able to figure out the finished size of the image if I were given the count of the fabric. I didn't know the best way to mount fabric in a hoop, of course. As you can see, I was pretty clueless. You aren't in such bad shape, but this class is designed to give you all the little tips you may have missed along the way. This is the also perfect class to tuck into your shedule before you hit the merchandise mall or if you need to rest your feet for a tad before attacking the mall again! As always, I've prepared a meaty handout full of much more information than we'll cover in class. The kit contains a bonus chart for a patriotic needlecase and scissors fob. Fly the flag in your needlework basket! Threads are included, too. We'll learn how to make prettier stitches, how to stitch more quickly and finish more projects, how to start and end tails, how to select/tame/store threads and fabric, how to put on beads, how to use/store metallic threads, etc. This is the 3rd year for this class. After you learn some fancy stitches, you've whetted your appetite for some more, and this class is meant to satisfy that hunger! Come learn eyelets (including the trick for a row of eyelets), knots (colonial, French, Palestrina, boss, and bullion), heringbone, rice, waffle, nun's, queen, Italian two-sided cross, Montenegrin cross, reversible cross, triple cross, Smyrna cross, chain, leviathan, Rhodes, Holbein, satin, surface satin, and rapid. Learn to couch (normal and with beads), attach pailettes, and do a Celtic knot pattern in a way that preserves your sanity. The basics of blackwork, silk gauze, silk ribbon embroidery, stitching over one thread, and Bargello will be covered, as well as three common Hardanger filling patterns (dove's eye, square filet, and spiderweb). Special attention is given to how to create an articifial selvage (plus a jiffy-way to prepare an area for fancy bundled-thread patterns) and a simple bundled-thread pattern. A reference section in the handout will give you gobs of info about needle sizes, fabric counts, thread types, and on and on! You'll be able to select any multi-technique chart and do it with ease! We'll do the techniques and stitches that most people have trouble with, starting with the artificial selvage and Hardanger fillings. As class progresses, choose stitches and techniques that you want to explore if you don't want to follow class activities. This is a class for you to learn those things you feel you need. The kit contains a chart for a sampler to display your new-found skills. Threads are included, too! This is a new class! If you'd like to get aboard the knitting craze but don't know which end of the knitting needle to blow in, this is the class for you! 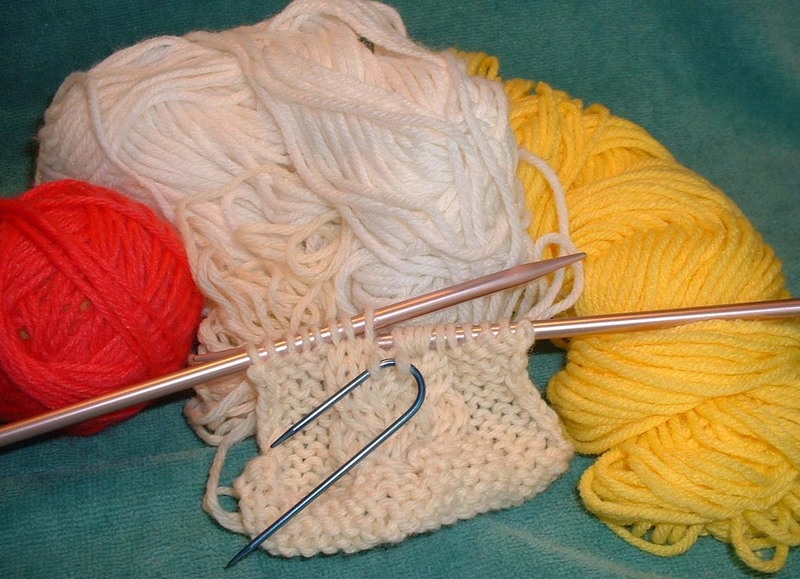 Learn to knit, purl, yarn over, slip a stitch, knit (or purl) 2 stitches together, make increases and decreases, cast on, bind off, and all the other basics. Learn some fancy patterns, too: eyelets, mock cables, ribbing, and a bunch of others. The handout will include a huge number of projects, including some quickies when you need something small and don't have a lot of time to knit it. You'll learn all about materials and gadgets, how to spot and correct mistakes, how to pick up stitches, how to read the "shorthand" in instructions, and all kinds of other stuff! Take your pick! There are lots of projects included. We'll make a sampler in class to showcase the techniques and patterns you've learned. knit, purl, slip, yarn over, pass a stitch over another, etc. how to read instructions, abbreviations, etc. how to spot errors and correct them, etc. all about yarns, gauge, tools, gadgets, etc. Some of the most beautiful knitted patterns are cables. Cables come in an incredible variety, and we'll be exploring some of the variety in this class. Not only will you learn a bunch of cable patterns, but you'll do some mock-cables, too. You need to know the basics: k, p, yo, inc, dec, sl, psso, and so on. Or, take the novice class first (#133, described just above). There will be lots of cable patterns to learn! I'll also show you how to "insert" a cable pattern in something that calls for plain stockinette so you can put these cables to work in your next project - - and change it from ho-hum to wow!-yum! We'll do basic cable patterns together, and then you are free either to choose patterns you want to try or to continue with the class on patterns I've chosen. We'll do a sampler of the stitches you learn. This is the 5th year for this class. Stitchers love gadgets (almost as much as they love chocolate!) Since you now have a huge stash of fabric and threads and you've expanded your collection of charts, the only thing left for Poor You is to increase - - or start - - your collection of stitching gadgets. There are all manner of gadgets. Those for poking, snipping, ripping, storing, twisting, flattening, finding, sticking, sipping, nibbling, and so many more! No project, per se, but there are bonus charts (and threads) for a stitcher's tool set. The theme is chocolate! We'll work with each gadget so you leave class knowing what each magical tool will do for you. You'll have a variety of fabric and thread with which to experiment. an incredible amount of other stuff; I'm still making the list! 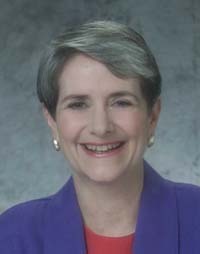 Drop me an e-mail at marbeth@marthabeth.com if you have further questions now. If you haven't seen me in a while, I have had a major haircut and look kind of different, but I'll still be in my trademark red and purple (as an old woman I have this prerogative, you see), and therefore I'm still pretty easy to spot in a crowd. If you will be looking me up, I'd appreciate a heads-up (well, a head count, really!) so I'll have enough gifts on hand. Classes are designated as different levels (beginner, intermediate, advanced; all levels). A beginner ought not to register for an advanced class, but someone who's been stitching a couple of months probably can do an intermediate class. Most teachers will give extra help to those who need it. In addition to classes, there are several meal events (progressive samplers, the "Show Shine and Share" event described above, and so on), a stitcher's lounge that's open around the clock, many free lectures and inexpensive "make-it-and-take-it" classes, and a merchandise mall full of the glory of a monster stash. To help ensure you get your first choices in classes, I think it's worth the extra expense to send your class registration FedEx or UPS or some other guaranteed-date-and-time delivery service. CATS is also accepting faxed registrations. (Each day, registration requests are processed in this order: FedEx/UPS, fax, mail. Some classes fill the first day, so don't dawdle with your registration if you have "must get" classes! More information is available in the catalog concerning travel hints, hotels, nearby attractions, and so on. the luxury of having all meals prepared for you and served; you don't have to give a thought to clean-up! the splendor of having the bed made for you and your room straightened and cleaned; even fresh sheets and towels every day! Can such a fantasy come to life? Now, you gents may not care a hoot about a long soak in the bathtub, but you -will- get the clicker all to yourself with no complaints, and you can leave your socks anywhere you please with no raised eyebrows. Best of all, though, is that nobody thinks it's unusual that you chose needlework as a pastime. In fact, we female stitchers wish there were -more- of you guys! Got any friends as cool as you? Elsewhere on my home page, I have a very detailed file of other pointers and information about my experiences as a student at a stitch festival, if you'd like to read more about what it's like to go to one. I look forward to seeing you in class! We're going to have a ball!